UPDATE–The winner is Michelle [email protected]! I am a bit ashamed to admit that I used to be a Mountain Dew fanatic. The addiction started around age 16 and continued until I finally mustered up the strength to give up Mountain Dew completely over four years. However, I soon replaced my daily Mountain Dew habit with a daily Pepsi habit. When I began having at least two Pepsis a day, I decided it would be best to ban soda all together, which is what I did over a year ago. Our home has been soda free since then. Now that I pay attention to food labels and try to avoid artificial colors, flavors and additives, I am somewhat sickened by how long I put Mountain Dew in my body every day! 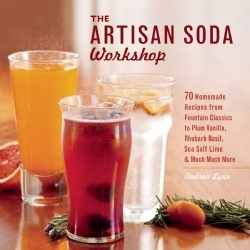 I was recently asked to review a copy of The Artisan Soda Workshop, and let me tell you, if you are trying to kick the Coke or Pepsi habit, this book is for you. Why do I love this book? It is filled with recipes for natural syrups to add to your Soda Stream or even just a glass of seltzer water. There are no artificial colors or flavors here. Whatever fruit you love, you can find a flavor to suit your taste. My husband loves blueberries and strawberries, so we tried the mixed berry syrup. He really enjoyed it. I didn’t care for it that much, but I wouldn’t normally drink a blueberry/strawberry soda. I used to also enjoy a vanilla creme soda in my day, but now I realize that drink was nothing more than artificial flavors. The first recipe I tried for myself in this book was Cream Soda Syrup, and it was delicious! I felt like I was drinking a vanilla creme soda, but with none of the nasty additives. This book contains recipes for 70 syrups. Best of all, the syrups have other uses too. You could also use them for syrups on pancakes or over ice cream or stir them into your morning oatmeal. They can also be used in a smoothie or mixed with vinegar and oil for salad dressing. I love how versatile the syrups are! In fact, I am thinking of cooking a banana and pouring a little Cream Soda Syrup over it. Ulysses Press, the publisher of The Artisan Soda Workshop, is giving one lucky Mom’s Plans’ reader their own copy of this book. For each additional giveaway entry, just leave a separate comment stating what you did. I received one copy of the book for review purposes. I received no compensation. I’d probably like to try a raspberry syrup… That sounds like it’d be pretty good. Strawberry cream sounds really good! it just never occurred to me that i might be able to make cream soda at home. i HAVE to try it! thanks for the inspiration and the wonderful giveaway! I’m with you on the cream soda- though the pineapple-basil in the book sounds interesting! I dont think I could pick just one, I like so many! This is such a great idea, I love the idea of making soda at home! Orange Cream like a creamsicle Thanks! I would love a blackberry flavor. I would love to create a blueberry ginger ale! I’d love to create a cranberry lime soda. Ive never made any, maybe a peach flavor. Liked Ulysses Press on FB. Liked Mom’s Plans on FB. Followed Ulysses Press on Twitter. Sugar-free Grapefruit Soda with honey or agave. I have my birthday August 24 and I am trying to stop drinking diet cokes (a new years resolution on my birthday)! I would love to try these new recipes out! Thanks for the great giveaway! I would love to try the cream soda. We just got a Soda Stream so this would be amazing! I’d like to try a rootbeer one! Oh, I can think of so many flavors I would like to try, like Watermelon Lime or Strawberry Basil. I would like to create a huckleberry soda. I’d like to make a Cherry Soda Syrup! I would love to try a blueberry pomegranate soda. I like UP on FB. I like Mom’s Plans on FB. I follow UP on Twitter. I would like to create a raspberry one. I have a soda stream, but I rarely use syrups with it. I would love to try and make a lemon cream soda. I’d love to try making a mixed berry soda. maybe honey/lime or some sort of citrus. meyer lemon & tangerine??? I would like to create a cranberry grapefruit. I’d like to try and make a strawberry cream soda. Although, my kids would love a lemon type one. I liked Ulysses Press on facebook. My facebook name is Tara Hendrickson Brooks. I would love to make a raspberry lemonade soda. I follow you on Twitter. I am @ilovepool. I follow Ulysses Press on Twitter. I am @ilovepool. I like Ulysses Press on Facebook as Dani Freeman. I would like to create a Cherry Limeade soda…yum!